Shep turned 4 months old on January 7th! 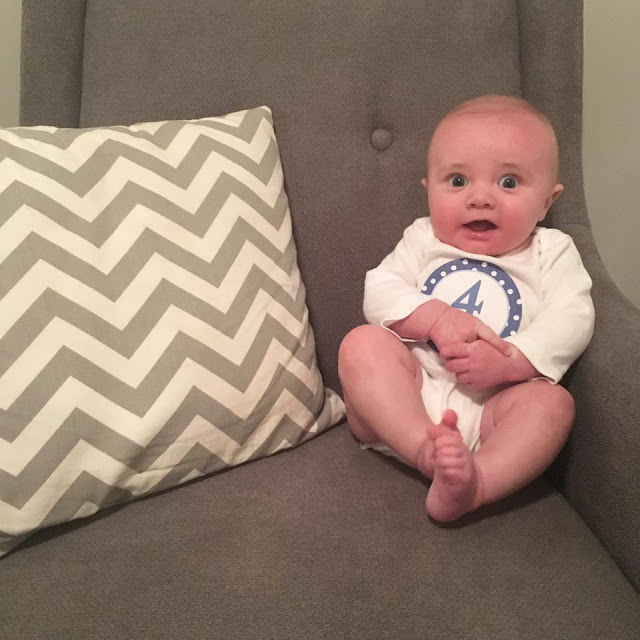 Weight/Height: At Shep's 4 month check up he was 15 lbs 11.5oz. I don't remember how long he was but I do remember them saying he is in the 98th% for height! Hair: Shep's hair is starting to come back on the top. It is coming in much lighter than before! Eyes: Shep is probably best know for his wide eyes ; ) He always looks very surprised ha! His eyes are still the prettiest shade of blue. Sleeping: Shep has consistently been sleeping in his crib for about a month now. Some nights are better than others but he is at least sleeping through the night without eating. He is still swaddled and it will stay that way until he stops scratching his head to death while he sleeps. Likes: Shep LOVES his mama. He loves eating and loves his brother! Eating: Shep eats five 7oz bottles a day. He has been on two different hypoallergenic formulas trying to find the best one for his particular needs. We finally settled on Similac Allimentum Ready to Feed and it has been a complete miracle. Shep's skin is almost back to perfection, he isn't having a million dirty diapers a day, and overall just seems happier with this formula. Milestones: Shep has been so close to rolling over! His body is rock solid and I really think it prevents him from being able to get all the way over ha!! Baby items we can't live without: We pulled the exersaucer out a few weeks ago for Shep and he has been LOVING it. It is nice to have another option for him to be in when I'm not holding him. He has done so well in it and likes playing with all the toys hanging on it.